If you have struggled calming your fearful dog, you are not alone – especially in Central Virginia, where intense thunderstorms are typical. Fear in dogs seems to be a very common issue, no matter the dog’s size or breed. Whether your pet is anxious about thunder, sirens, the vacuum cleaner, or other loud noises, you can try these calming techniques. Seek professional advice if further help is needed. 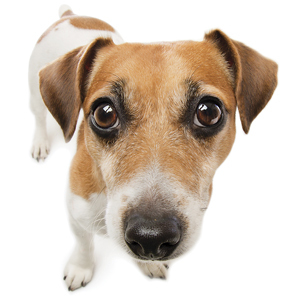 The first step is to observe your dog and try to recognize early signs of fear setting in. These can include: a panicked look on the dog’s face; darting eyes; a change in posture or a tense body; constricted pupils; excessive yawning; and pacing. As you begin to notice these early signs, you can take steps to calm your dog sooner in the cycle of anxiety before he gets completely aroused. Keeping your dog on what’s called the calm plain, as opposed to the hill of arousal, will help avoid escalation into what no pet lover wants to see – panic. It comes down to this: When a dog is in a calmer state, he can be more obedient. When a dog is too excited, he is in an instinctual mode and much harder to control. Above all, when your dog is worked up or anxious, do not coddle your dog or use a baby-talk tone of voice. When doing this, you are, in fact, rewarding the dog for his behavior. Remember, giving any affection during a state of arousal will serve as a reward for the dog. So become conscious of how you have previously interacted with your dog during this state of arousal and fear. Now, try teaching calm as you would any command, like sit or stay. Simply go near your dog, as close as possible and place an open-finger spread hand on, or near him. Do not move your hand. Just hold it in one place and take a good, long deep breath. Concentrate on your breath and try to slow your heart rate, which will calm your dog’s heart rate as well. A key to this is to practice numerous times when your dog is not fearful, but just slightly aroused. You want your dog to understand that you like this state of calmness, and that this calm is now a new command that pleases you. Another strategy for calming your dog is to use body language. Dogs understand body language. Again, it’s important to practice this when your dog is calm. Face your dog, stand tall, open your hands, and have palms facing the dog. Slowly walk forward into your dog and use a long, drawn out Shhhhhhhh sound. Stop moving forward when your dog relaxes a bit. You can also add in a calming touch to enhance the exercise. Smile and stay relaxed yourself. Verbally reward the dog, then walk away. As you practice this technique, your dog will learn to calm. He will begin to learn that when you face him, you are taking over the area or claiming the space, and that he should just be calm and back off. When you face your dog, he understands you are dealing with him and he should respond to you, and that the distraction is behind you and it is of no concern to him. This same technique works whenever your dog becomes aroused – door greetings, outdoor stimuli, and arousal on walks. A few other methods that have helped some dogs with certain anxieties – especially working through thunderstorms – can be explored as well. For starters, encouraging your dog to go to a safe space inside your home can be helpful for some dogs. Try a large closet, bathroom, or even a bathtub, typically in an inside room away from doors and windows. Some folks have had success with tight fitting t-shirts or the ThunderShirt product. The premise here is that it squeezes or hugs your dog to physically calm him. We have experienced the most success with these methods when they are used in conjunction with calming techniques. As an extreme resort, you may also talk to your veterinarian about medication to calm a dog, although typically the drugs need time to take effect and managing the timing of a fast-moving storm and an anxious dog can be a challenge. So, whether the fear is significant or minimal, addressing the fear and developing techniques to calm your dog will continue to create a balanced and well-mannered pet. Remember, recognizing and calming the fear early and practicing calming techniques at low levels of arousal will help maintain an overall calmer state. Ultimately, you want your dog to be more obedient and experience lower stress levels. These techniques should help. Previous articleIt’s August and your poolside reading is here!